It was 1991. Finance Minister Manmohan Singh gave a landmark speech about bringing the wall down on the economy. He said ‘barriers to entry and limits on growth’ had increased monopolies in India. ‘Mann pasand’ appeared to be a code word for monopoly. It was the very first time that a company, Captain Cook, had tried to challenge the dominance of ‘India’s favourite salt’, Tata Namak. The popular advertisement featured Sushmita Mukherjee (Kitty of Karamchand fame) with a voiceover by Jaaved Jaaferi. Her bias towards the ‘mann pasand salt’ (a lookalike of Tata Salt) was evident in her facial expressions when she reluctantly compared it against the free-flowing, non-sticky Captain Cook. Jaaferi was the narrator of her thoughts. Of course, Tata Salt had, by then, positioned itself firmly as ‘Desk ka Namak’, capturing over 80 per cent of the market. It was the only branded salt available in Indian stores at that time. So, advertisers turned to the Indian hard-nosed, sanskari naari-in-a-sari to dislodge the brand from its pedestal. It was also an interesting makeover for ‘Kitty’, who ruled the 1980s in the popular TV series Karamchand, which showed her as a very dumb assistant to a smart detective. DCW Ltd, a chemical products firm, launched the salt brand to mark its foray into the FMCG sector. The company knew that salt falls in the ‘low-value category’, so it chose to invest big in its promotional strategy. It hired a popular ad agency, Lintas, to develop its promotional strategy. “A name ‘Captain Cook’ was selected with the criteria that it should give cues about ‘cooking’. Also, we wanted to bring some mystique into the brand name,” said Hemant Mishrra, who was the vice president (Sales & Marketing) with DCW Home Products during 1991-96, when the brand was launched in the Indian markets. It was named after Captain James Cook, a British explorer, navigator, cartographer and captain in the Royal Navy. He made detailed maps of Newfound land prior to making three voyages to the Pacific Ocean. During those days, Doordarshan, India’s public broadcaster, reached 70 per cent of the population. With the entry of Zee Television, advertisers started eyeing private TV channels too. The makers of the brand decided to advertise aggressively on television by combining the ad slots on Doordarshan and Zee. “We took membership of Zee TV and got excellent discounts to air our commercials on prime time,” said Mishrra, who is now the founder of Neeti Brand accelerator, a brand consultancy firm. Indians started trying the brand, and the company claimed that ‘it grew by almost 300 percent’ every year and became a Rs 100 crore-brand in its fourth year. But Indian consumers’ interest in Captain Cook salt was short-lived affair. Tata Salt was priced at Rs 2 per kilogram. However, Captain Cook was priced at Rs 3 — 50 per cent higher — to create a perception of better quality. “We wanted to send a message that Captain Cook Salt was a superior product in quality, hence it was priced higher,” said Mishrra, explaining the brand’s case study. But it was not just its pricing that buyers frowned upon. What most consumers complained about was that Captain Cook tasted less salty. “I remember buying Captain Cook. Despite an expensive option, I gave it a shot. But never bought it again. After one try, my family complained of less salt in food. On one hand, it was expensive and on another, it was consumed more,” said Anjana Saluja, a 35-year-old homemaker. In 1998, after understanding the consumer feedback, Tata Salt launched a counter campaign in retaliation—with the tagline ‘Saltier Salt’. It also included the ‘free flow’ proposition in a subtle manner. “I still get lot of enquiries from people who want to become distributors or want to buy it,” he adds. 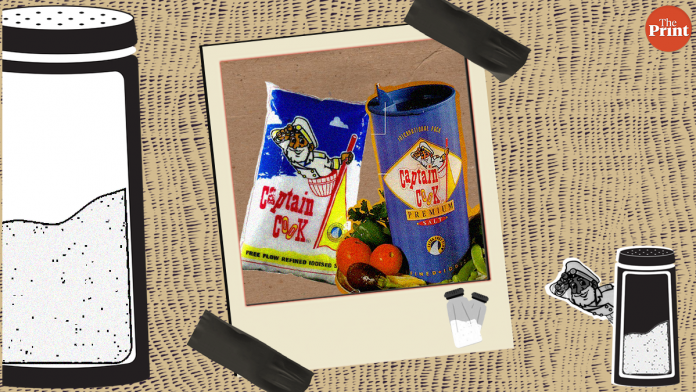 Captain Cook was later acquired by the FMCG giant Hindustan Unilever and it was available in select markets in Uttar Pradesh and Maharashtra till 2012. Presently, the brand does not feature among the list of products HUL sells in India, available on its website. An email sent to the company about the existence of Captain Cook received no response at the time of writing this article. This story will be updated when it comes. And so, Captain Cook will remain a brand that was almost worth its salt.